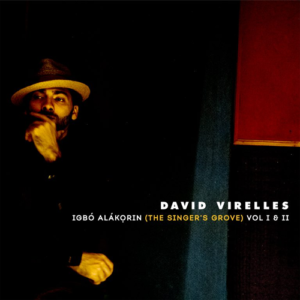 Listeners – simple and sophisticated – who have, by now become used to the music of David Virelles might come to expect that with each recording he will push further at the boundaries of music that has grown out of his Afro-Cuban heritage, especially since his last couple of recordings with legendary Jazz musicians such as Henry Threadgill and Steve Coleman. With Igbó Alákọrin The Singer’s Grove Vol. I & II they are in for – not a surprise – but a shock; the surprise being that with this recording Mr Virelles returns to the glory days of the trovadores (of at least a hundred years ago) and shock because he plays the music in the authentic style that it was played back then – in the grand manner of the musicians of Santiago de Cuba (or Oriente, as it was called before 1905), and by musicians such as those in the Chepín-Chovén Orchestra (as he tells us in his brief notes), one of the legendary Afro-Cuban bands of Cuba. And yet while this is a nostalgic return to his own Afro-Cuban heritage into which he was born and schooled by his father (and mother), it is far from sentimental and retrograde; rather a musical excursion into what makes Afro-Cuban music – danzón, Oriental , chepinsón, pregón, bolero and trova – so magical. And even if you have to wait until “Sube la Loma, Compay” for the angular dissonance to emerge from the pianism of Mr Virelles, it is a dreamy voyage throughout. In many respects this musical journey could be made countless times and each one will feel as if it is your first time, just as it is listening to Schubert’s Lieder or Mahler’s for the first time, because like classical song, this music, which has been centuries in the making is forever fresh – certainly as it is on this recording. The music also puts the young Mr Virelles in the enviable company of his ancestors such as Bebo and Chucho Valdés for the dazzling simplicity of both his musicianship and his pianism. At no time is the listener distracted by gratuitous virtuosity. Every note and every phrase with each nuanced accented utterance is a model of craftsmanship. There are two volumes to this single disc. The first highlights music played in an orchestral setting and featuring the incomparable trovadores Emilio Despaigne Robert and Alejandro Almenares, who also accompanies himself on the requinto, a guitar unique to Cuba, both of whom conjure the halcyon days of the trovadores. Volume two highlights Mr Virelles in a duet setting with Rafael Ábalos accompanying him on güiro in a virtuoso performance which sets the bar at a new height for that instrument. This repertoire comprises fourteen songs and together the recording unfolds like the soundtrack of a classic film in which visuals appear like wet canvases melting one into the other as the music ebbs and flows until its final dénouement. Throughout it all, whether he is featured on his instrument or playing in the shadows of the spotlight which shines on one or the other vocalists or musicians soloing here Mr Virelles gives a stellar account of his ingenious musicianship as we become not only mesmerised by the naked beauty of this music but by the unbridled genius of the young pianist who is bringing it all back to everlasting life.